The current version of Numerology is 4.2, which is a transitional release that includes updates and fixes for Numerology 4, and a few hints of what is coming in the next big release. Be sure to check the forum News section for the latest builds. Also on the forum is the official development announcement for Numerology 5. The latest Vector Sequencer firmware is 1.0.7 and is highly recommended. You can get it here. The Vector Sequencer is a sequencer for Eurorack modular. It includes many of the goodies from Numerology in a tangible, touchable physical format, complete with a bold graphic design based around a pair of deliciously contrasty OLED displays. 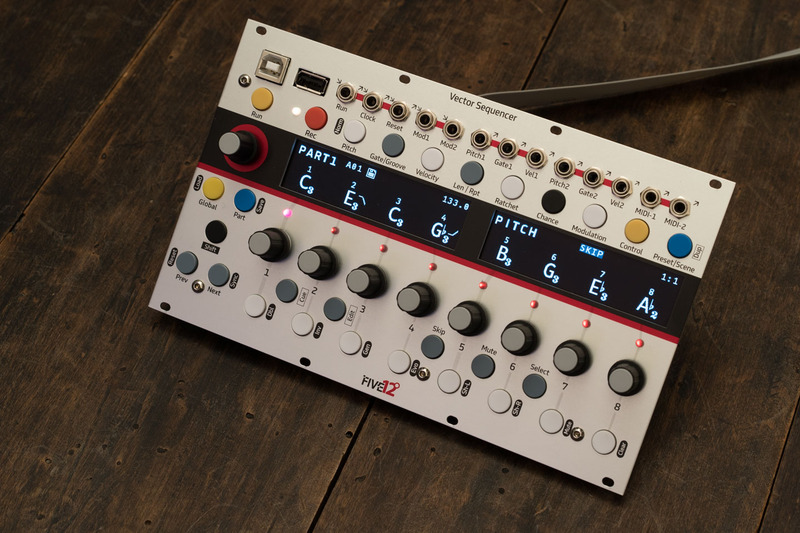 It has eight parts, flexible I/O with both MIDI and CV, and loads of new generative sequencing tricks. The Jack Expander greatly expands the CV options for the Vector by adding 4 sets of Pitch, Gate and Velocity CV, as well as 8 bi-directional triggers, MIDI I/O on DIN jacks, and DIN Sync. For sales in the EU check out SchneidersLaden. In the UK, SignalSounds will also be carrying them. In Australia, contact Found Sound. If you are in the US, Canada or elsewhere, contact us directly: info (at) five12 (dot) com.